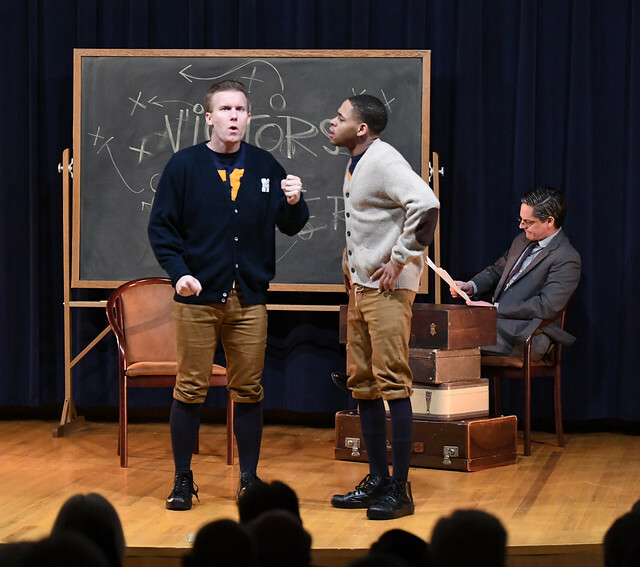 The story of a young Gerald Ford and his friend and teammate, Willis Ward, came to life on stage for hundreds of audience members of all ages at the Gerald R. Ford Presidential Museum. On February 15th, 2018, Victors of Character: a Story of Loyalty, Integrity, and the Courage to Make a Difference premiered to a packed auditorium. The live theater performance was commissioned by the Gerald R. Ford Presidential Foundation and written by Grand Valley State University professor and playwright, Dr. Allison Manville Metz. Based on a true story, the play tells the story of a young Gerald Ford who, as a student and athlete at the University of Michigan, witnessed the heartache and division caused by racial discrimination when his best friend, Willis Ward, was benched from a game against Georgia Tech because of the Jim Crow laws of the south. The play allows the audience to experience not only the events of 1934, but also to learn how this experience shaped both Ford and Ward as leaders later in life. A total of four performances, directed by Jason Flannery, were held for students in grades 4-12 from schools all across West Michigan. An evening performance was also held for community members with a reception afterward during which audience members could interact with the cast and crew. Both the student and adult audiences were encouraged to continue the dialogue ignited by the play and to remember the lessons learned from the past. The play was met with rave reviews and we hope to bring it to many more students in the months ahead. Many thanks to the following sponsors who supported this important educational initiative: Mercantile Bank (Premiere Sponsor), BHS Insurance, Red and Sheri Cavaney, Dr. Robert Humphries and Mrs. Marie Zerweck, SeyferthPR, and Warner Norcross & Judd LLP (Spotlight Sponsors). is available for purchase on Amazon as well as in the Museum’s gift shop.